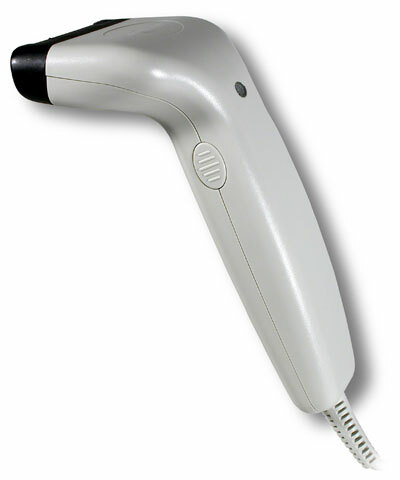 The Hand Held Valueteam 3080 has been discontinued. No direct replacement is available. VALUETEAM scanners offer the excellent scanning performance you expect from a Welch Allyn brand product at an attractive entry-level price. The VT3060 connects to the most often used terminals and PCs for Point-of-Sale or general-purpose applications. The VT3060 has a reading width of 60 mm (2.3 inches) is appropriate for most applications. When barcodes are wider the VT3080 with 80 mm (3.1 inches) reading width will handle them. Both scanners read in contact with the barcode and are compact in size and comfortable to use. Valueteam 3080 Entry Level Hand Held CCD Scanner The VALUETEAM 3080B scanner offers the excellent scanning performance you expect from a Hand Held brand product at an attractive, entry-level price. It connects to the most often used terminals and PCs for Point-of-Sale or general-purpose applications. The Valueteam 3080 reads from contact to 2 inches (5.1) cm) from the barcode, has Flash Memory, is compact in size, and comfortable to use. HHP sets high standards for scanner durability. The VT3080B is designed to take the punishment of daily use. When you need value, but still want HHP performance, choose the Valueteam 3080 .